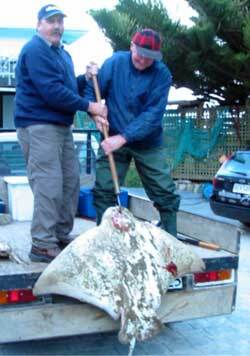 The sting ray photo below is of Gary Kemsley and Wal Stoddard with a NZ pending record for an Eagle ray. 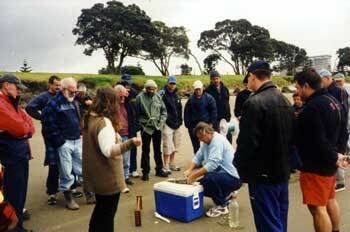 The ray was caught caught by Gary Kemsley on 6kg line at Porangahau Beach in September 2003. Last weekend saw more favourable weather for fishing down our coast and the following catches were reported. Harry Job from Hastings with his Paul's Super kite on a bottom line rig caught five good size gurnard, one rig, and two kahawai. 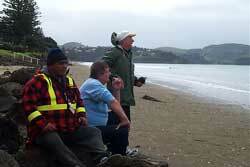 Gary and Sue Kemsley from Napier came looking for another surfcasting record, but it wasn't to be this time. 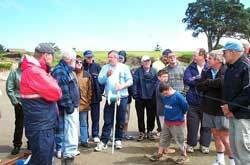 They caught two gurnard, the heaviest was 1.14kg, three kahawai and one rig. 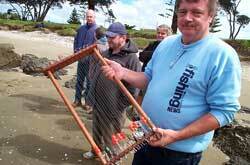 Brett Harris from Waipukurau caught two gurnard weighing 1.42kg each and three kahawai with his super kite powered rig. At the time of writing this, Saturday October 4th, we have a 40 to 50 knot south westerly and a couple of keen fisherman are still out on the beach. The crays at the moment are all female with berries with no sign of the bucks coming on yet. With the southerly storm passing through this weekend things will change and hopefully fishing should be good for Labour weekend. Don't forget if you are passing by call in and see us in our new shop with a full selection of Paul's Kites. A 6 meter long (20 feet) shark persisted and harrassed the hapless kayak fisher for 30 minutes? September has been a very rough month with only two days where I was able to fish. My new large Inflatable kite (Mega Air 3) was tested in big seas and pulled my bottom longline rig out through waves where my Mega Mouth would have struggled. Because of the lightness of the new kites they use the full wind power as they sit high and don't drop down or go backwards when the wind weakens. It is a more constant, stronger pull than any kite set up I have used before. I accidentally punctured one of my bladders and found a simple way of replacing by using a piece of fiberglass rod from another kite and cellotaping the valve on to it before slowly inserting the new bladder up the sleeve of the kite. I then released the tape, pulled the rod out and inflated the bladder with the pump supplied. Another local, Geoff Allen, has started kite fishing and has caught his first snapper setting only once at the start of the month. His fish currently leads the monthly competition at 2.5kgs, no boats have been able to to fish with the weather being so bad, so it's up to us kitefishers to keep catching them! The photo this week is of the other big snapper I caught last month. You can just see our mountain in the background. The snapper weighed in at 9.5kgs. 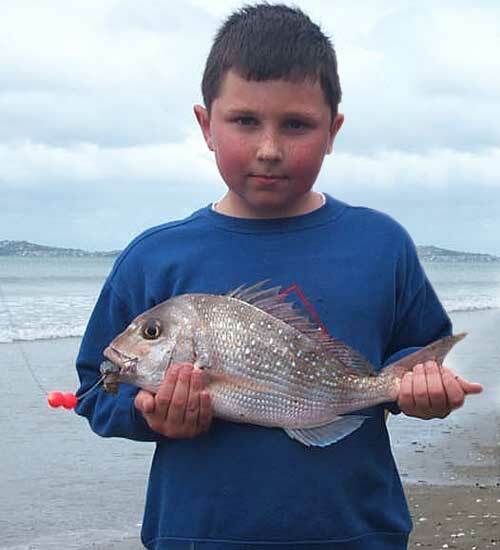 On Sunday, October 5, Paul and I loaded up the 4WD, picked up 4 large fresh mullet and headed up to Orewa Beach to do some fishing and our first demo for the year. A special thanks to Bodo Luckfiel and Jill Frost for taking the photos. We arrived on the beach just before noon and although the forecast was for fresh south westerlies easing in the afternoon, the winds were 30 knots with gusts to 40 knots and more. It was an overcast day, ideal for fishing the shallow waters of Orewa and the occasional rain squalls failed to dampen the spirits of the kitefishers. We were amazed to have around 40 to 50 people attend the demo, despite the weather conditions and it was great to see so many friends who we hadn't seen for quite some time. Initially we stuck a reel in the grass up on the bank and tested the strong wind performance of a new small inflatable kite, it was it's first ever flight. The smaller inflatable, which we envisage will eventually replace the Flexiwing Kite, handled the 25 to 30 knots winds with no problems and the pull delivered from this small inflatable kite amazed everyone. One of the stronger gusts however proved too much for this particular kite and it came down in a gust of about 40 knots. Being an inflatable though it was easy to retrieve. Paul decided he will put a slightly bigger bladder in this kite and try it in the next gale as he wants it to be able to fly in winds up to 60 knots. We opted to put out a Flexiwing Kite rig from the standard sized beach reel spooled with 31kg nylon. The rubber bands in the wings of the Flexiwing were doubled over the wing spar clips in order to provide more stability in the gusty conditions. We attached the bridle and drogue as normal, but also added an open shopping bag tied through the handles to the end of the drogue line. This was to provide further stability in the squalls. The Kite was airborne and at full fishing height within seconds. With the strong winds of the day the kite flexed it's wings back as the rubber bands stretched reducing the wingspan by half. As the kite bit into the winds it looked more like a curved spear head rather than a delta kite. Upon settling the kite flew very well and was very stable, delivering a constant pull of 3 to 4kgs. As we connected the dropper line and proceeded to set up the rest of the terminal tackle, I realised I had forgotten the float bottle! We scrounged around the beach and discovered a large coke bottle which we attempted to connect to the dropper line, unfortunately this wasn't going to be anywhere near large enough. One of the kitefishers attending the demo came to the rescue with a 2 litre bottle he just happened to have in his car. With the bottle filled to the top with sand, it was just enough weight to keep it from lifting off the beach. We baited up 12 traces and attached them to the hook section. Then we clipped on one 4 oz weight to the front of the hook section and one 2 oz weight at the back. The good thing about using dropper rigs is the ease of getting the weighting correct. As long as the bottle is in the water, the hook section will remain on the bottom. 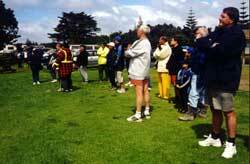 The rig was then set to the full 1000 metres offshore and left to fish for around one hour. Further down the beach, around 250 metres away from Paul's rig, I began setting up a large 65kg dropper rig with the assistance of Bodo Luckfiel, Willie Kipa and several other experienced kitefishers. We had a choice of using the Nighthawk Kite or the Super Kite, and with the strength of the winds we opted for the Super Kite. A wise decision in everyone's opinion. After getting the kite up we still had the problem of having no bottles, and again the well equipped kitefisher came to the rescue with another 2 litre bottle, but this just wasn't enough. The Super Kite, fitted with a 10mm Tawa dowel across the back, was pulling at least 6 to 10kgs so we still required more weight to hold the line down. Another bottle was needed, but where do you find another 2 litre bottle on the beach? A demo onlooker quickly became the focus of everyone as he quietly enjoyed his drink of chocolate primo, in a 2 litre bottle! Without too much persuasion the bottles' contents were emptied and the second bottle was filled to the brim with sand. One 8 oz weight was attached to the front of the section followed by twenty two traces. An assortment of standard Target Hook traces, traces with lumo beads and some double floating beads traces were attached to the hook sections. Two 4 oz weights were clipped to the back swivel of the hook section. We set the rig out to 1000 metres offshore then I left it in the capable hands of the experienced and eager kitefishers as I went back along the beach to give Paul a hand to pull in his Flexiwing rig. Paul, Willie and Bodo take a well earned break after setting their rig. With so many people happy to lend a hand, it didn't take long to retrieve the gear. Bodo even insisted on everyone keeping their hands off the gear at one stage so that he could show everyone how a man in his sixties can easily bring in the gear all by himself. It was a great demo by Bodo and magic to watch. Bodo actually fishes the larger 65kg dropper rig by himself, so pulling in the Flexiwing single handed was a piece of cake for him. The hook section arrived back on the beach but no fish. All the baits were still intact and the hook section was slightly tangled. It appeared as though the hook section had pulled back over itself during recovery. Paul says the problem of tangling the hook section can be easily overcome simply by walking the reel 50 to 100 metres up the beach into the rip a quarter of an hour before hauling the gear in. This allows the hook section to turn around without running over itself during hauling. We moved back along the beach to the large dropper rig and I insisted on taking the chilly bin with us so that I would have something to put my fish into. Okay, I am an optimist! Anyway, the rig was already being hauled in and the hook section was pulled up onto the beach as I got there. 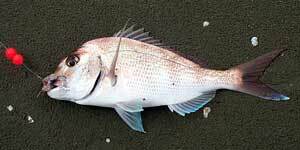 We had two fish on, one snapper and one kahawai. Yahoo!!! Just out of curiosity, the only snapper for the day was taken on a floating bead trace. Again the hook section was tangled but next time we will tell everyone helping about the need to move the rig 15 minutes before hauling. Despite catching few fish, both rigs performed well on the day and the kites flew flawlessly and never looked like coming down even in the strongest gusts. The demo came to an end around 3:30pm. Before Paul and I headed back home, we went along the beach to where Aaron and Petra Buxton were fishing their 2000 metre two kite dropper rig powered by a Nighthawk Kite and a Super Kite. The pull from these kites had to be felt to be believed. Standing beside the reel you could clearly hear the line wailing like a banshee in the gale. In order to secure the reel in place, Aaron had fixed a heavy rope between the reel and a picnic bench which was cemented into the ground and for hauling he had a pair of full length leather welding gauntlets. Their first set was put out full distance and returned with no fish. Subsequent sets to 1600 metres out, 1200 metres out, 1000 metres and 800 metres all returned with no fish. They decided to do just one last set for the day before the light faded into evening. Looking out to sea there was a clear difference between the muddy inshore water caused by the rain and the blue water mark, which was about 400 metres out. They ran their last set to strategically position their hooks just beyond the water colour change. Their tactics paid off and the last set returned with two fantastic 12 lb snappers. Well done Aaron and Petra! 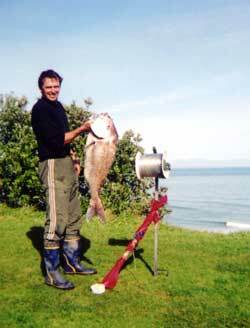 This time of year is great for night fishing at Orewa and had we, or anyone else, fished after sunset I am sure some really good fish would have been caught. Daniel, Corey and Wayne were going to head up to the demo at Orewa on Sunday but after looking at the weather changed their minds and headed down to Waihi instead. Setting out their motorized kontiki with Target Hook traces they wound up 10 nice snapper between 5 and 8lbs and 4 awesome gurnard. They also wound up with a hot sunny day and plenty of wind.